There are many companies in the world that claim to be Christian companies. What this generally means is that they adhere to a religious view that falls within the pale of orthodoxy in the Christian faith. Many contractors will put the Christian symbol of the fish (Ichthus) on their business cards and on their service vehicles. They do this because they know that Christians ought to be held to a higher standard than others, if only by virtue of their lifesytles. Over time; however, the fish symbol on a service vehicle has become diluted and now it is said, “Beware of the fish.” This indictment is the reason we are adding this to our website. 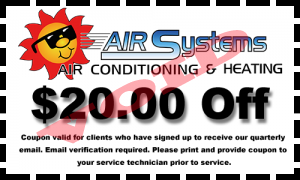 We want to show that there are indeed true believers who stand behind the integrity of the cross and it shows in the work ethic that the members of Air Systems Texas has. So, when we say we are a Christian company, we expect that you will understand that we are going to meet or exceed your expectations because we are working for the Lord first.